Visions of Jesus Christ.com - Anna Bohuslava Tomanová - Stigmatist. 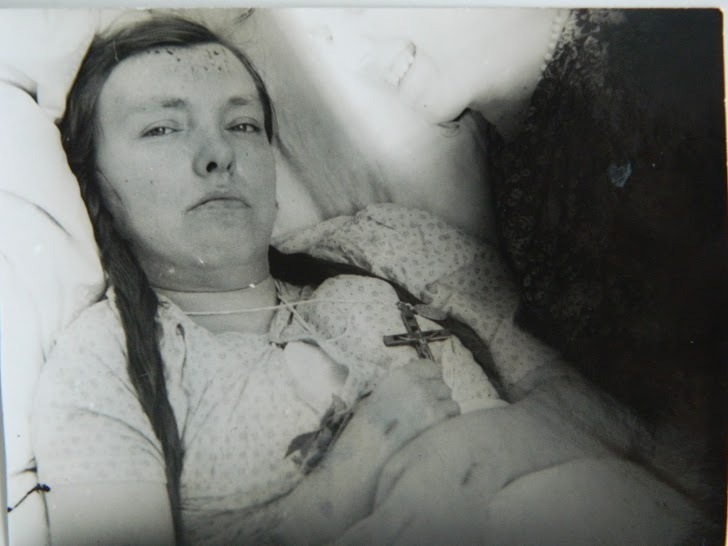 Anna Tomanova - Paralyzed lay-mystic from the Czech Republic who was not only favored with Stigmata but she also received the spiritual gifts of Healing and Prophecy. Her cottage was visited by many pilgrims who sought her prayers and advice. Rough translation from Czech. She was born on November 8th 1907 in pastures parish Klášterecí in the Eagle Mountains, Czech Republic. Her parents were Bernard and Anne Tomanovým. In four years old at a neighboring building she suffered a fire accident and gradually became paralyzed. Thanks to the priests of Klášterce and surroundings she received religious education. Gradually her suffering connected with Christ of Calvary sacrifice, she received the stigmata on the hands, the feet, and the head. Anna's mystical suffering were sacrificed especially for priests and for the holiness of their lives. Furthermore, the sacrifice for the freedom of the Church and religious orders being oppressed. She patiently received numerous visits and she had good and encouraging words for everyone. When she learned of the serious illness of others, often begging the Lord to have suffered in their place, and had been heard. The intentions of their neighbors for the many sleepless nights praying rosaries. Among other things, proves her devotion to the Virgin Mary. O heroic virtues Annie evidenced by the Prague canon Antonín Stříž, her last spiritual leader until her death on 29 March 1957. In his funeral speech highlighted her humility, patience, heroic, deeply Christian thinking, loving union with Christ, with a tender devotion to the Mother of God, readiness to sacrifice for fellow human beings. God for life and after death, miracles through her intercession and today many come to her grave believing that, ask the intercession of and are wonderfully heard. Anna Tomanova's Cause for Canonization was opened in December 2013. Learn more about these events [here], [here], [here] and [here].